Argaum Villas comprises, or comprised, six large semi-detached houses (or villas) at the Stoke end of Valletort Road which, unhappily, are in the course of losing their individuality through the requirement to number them as part of Valletort Road. At No. 4 lived Richard Heard and his family, certainly from 1885 until 1913 (a member of Richard Heard and Sons, wholesale butchers of the G.W.R. Docks and Market Street, Devonport) cheek by jowl - with the Plymouth Borough Surveyor who lived in No. 6, so that when in 1887 a new rugby club was formed, with its secretary Mr. Heard (we do not know whether pere or fils, but suspect the latter), there was no real problem in finding a name for the club, more especially so, when there was precedent from such contemporaneous rugby teams as Haddington Road, Mutley and Ford. Whether 'Plymouth' was included in the original Argaum title or was added at a later date is impossible to say, but early reports, when available, referred to the Club as Argaum. Indeed, throughout most of its history the Club has suffered from a lack of reporting, possibly due to the failure to realise the need to supply news to the media and not vice versa; so it was not until one P. E. Canning-Bailey joined the Club in 1902, largely in a non playing capacity, although he made some appearances for the 2nd XV, that reports began to appear with a certain regularity. This was possibly due to the fact that the Editor of the Western Morning News from 1902 - 1921, was a Mr. P. E. Canning- Bailey. As later Mr. P. E. Canning-Bailey doubtless sought pastures new, so the reports decreased and finally ceased. However, although early press coverage is apparently non-existent, no less than the late Rear Admiral H. S. Brockman CB, President of the Devon Rugby Football Union at that time, recollected having played for Argaum in 1898. E. Lake, H. Glanfield, A. C. Grigg, C. G. Sweet, S. C. Langford, F. A. Lewis, E. A. Richardson, W. A. Griffiths, E. W. Dudley, E. de Ridder, E. Richmond, A. Mattheson, T. Vosper, and L.A. Clifford. The club has in its possession, a Plymouth Argaum "cap" from this team, presented by Mr. Ernest Lake. The writer had the privilege of knowing Mr. Lake in the latter’s closing years and with the advantage of hindsight, bitterly regrets he did not then pursue the Club's early history with him. Mr. Lake was for many years a surveyor with the Great Western Railway and, in part, responsible for the Keyham viaduct (now to be demolished). Incidentally, Mr. Lake also presented the club clock, which still performs valiantly in the Clubhouse today. On 15th November 1902, two days after the Newton College game, with D. Stanton replacing Glanfield and Hamilton for Vosper, the club lost its first recorded result to R.N.E. College III by a margin of 4-3 goals. In the following week, they lost again to the town side at Modbury, by a score of 3-9, when playing one short. There follows a gap in results and reports which resumed in December, when away to Kelly College, when the club lost 8-19 - a goal and a try to 2 goals and 3 tries. However, the following week, with a score of 24-3, is the first record of a club win - this over Newton College. The week after (with a team of Mattheson, Hamilton, Grigg, de Bennett, Saret, Woolley, Stanton, Richmond, Lewis, Dudley, Griffiths, S.D. Hamilton, Dudley and A.N. Other) Argaum succeeded against Ivybridge Reserves, to the tune of 13-0 (2 goals and a try). A further Argaum cap, this time that of E . V. Woolley, is in the Club's possession. 1903 records defeats at Bere Alston 3-4, Modbury 3-9 and Pembroke United 0-6 at Beaconsfield, played 'under unfavourable climatic conditions', the home side having a slight lead throughout. Thereafter followed Ivybridge, presumably this time their 1st XV, where, 'the home side's mobile pack had matters much in their own hands and scored a goal, a try, and a penalty goal to a try'. On 14th January a journey to Tiverton to play Blundells School. In those days the journey would have been made by train, which must have occupied a full morning. The result - and a report of some length - records a win for the school 6-0. The report speaks of 'Lake getting away with a fine sprint but failing to get through. Argaum's forwards were playing grandly and Richmond was tackled on the line. Sweet obtained from a scrum and dodged through but was held just outside - a pleasant game ended with Blundells 6 Argaum 0'. A 3-3 draw v Bere Alston, a marginal improvement on the New Year's result, and Hope Utd a similar score (Street Penalty Goal ). On March 21st R.N.E. College III provided, yet again, a rare victory for the club 8-3 with tries by Sweet and Richmond and a conversion by Grigg. Thereafter, the College did most of the attacking, but were restricted to a goal from a mark. After the match, at the invitation of the Committee, the Argaum club entertained members , the students (RNEC), and friends to a smoking concert at Farley's Hotel, since alas, destroyed in the Plymouth blitz! The season wound up with a 0-0 draw v Pembroke Utd and wins to the extent of 8-0 v Ivybridge and 14-0 v Hope Utd at the Rectory where, leading 3-0 at half time, Argaum made their superiority more pronounced in the second half, scoring in all a goal and three tries. The team selected were Mattheson, R.L. Bryant, C. Street, E.D. Coppin, Lake, Sweet, Grigg, Waters, de Ridder, S.F. Dudley, P.H. Stidston, G.B. Hunt, Dixon and A N Other. Season 1902-03 contains a fair number of results and accounts, attributable most likely to P. E. Canning-Bailey. The selected teams contained some 7 or 8 'regulars', whilst towards the end of the season A.P. Heard was amongst those consistently chosen - 'shades of Argaum Villas'. An interesting sidelight on two of the regulars A.C. Grigg and F.A. Lewis, was that the previous season, they had been playing for Plymouth Argyle Reserves, who at that time were regularly fielding two XVs under the Rugby Union Code. The season opened on 3rd October against R. N. E. College III, when 'not at full strength, Argaum lost 5-6 and finished one short', the try was scored by Heard, Vincent converting. The team for this game included Mattheson, Grigg, Lake, Sweet, Richmond, Vincent, Heard, Griffiths, de Ridder and Dudley, who had been the backbone of the previous season. On l7th October, the 1st XV travelled to Newton College, where 'the visitors had the whole of the fun to themselves, showing capital combination, winning by 3 goals and 11 tries (48) to Nil' (the goal kicking department seems somewhat suspect!). Then followed away games at Kelly College (no published result) and Blundells 6-8 'in a downpour' Richmond scoring a try and Grigg a penalty goal. On 24th October, Plymouth Reserves at South Devon Place (a step up in opposition?) played in fine weather before a fair crowd, as it transpired, preceding the Plymouth 1st XV v Redruth game! The advantage lay with Plymouth, with Argaum defending pluckily; 0-3 at half time, with a final score of 0-11. The following week, whilst the 1st XV were winning 16-3 at Bere Alston, an imaginative piece of fixture making sent the 2nd XV to Newton College, including two A N Others, where they lost an evenly contested game to the College 6-9. The next report is a further fixture at Bere Alston 'played in very dirty weather and ending in semi darkness', a try by Sweet giving the club a narrow victory. The Boxing Day game was away to Exeter Reserves, the result a 0-17 defeat. Argaum's custodian (A. Mattheson) was not found wanting! The new year saw St. Chads 0-3, Bere Alston (yet again) 0-0 and Pembroke Stars 'in lovely weather, with tries by Mattheson, Saunders and Vincent plus a conversion (Vincent)' 11 points to nil. Meanwhile, the 2nd XV (including P. E. Canning Bailey) won 12-3 at Ugborough. 'Argaum had only 11 men', which either speaks highly for the 11, or not so highly for the home side, Mogg 2 tries Smith 1 and an Edwards Penalty Goal. Then followed 3-12 against Brent and 3-3 v Hope Utd at Torpoint, Coles scoring the second side's try. On the 1st XV front, Plymouth Reserves emphasised their superiority to the tune of 17-3 and then a narrow win 6-3 over HMS Cambridge. On 5th March, the 2nd XV beat Plymouth and Mannamead College 36-0. Argaum played several Chiefs (1st XV players) there being no mention of a 1st XV fixture on that date. There followed defeats for the first team v St. Lukes College 4-22 and R.N.E. College II (a step up in fixtures) 0-2, but Argaum wound up the season beating the Naval Barracks at St. Budeaux 13-6, with tries by Mason(2), Tregus(1) and two Grigg conversions. Of the team for this game, six of the original 1902/3 side appeared; Grigg, Mattheson, Sweet, Richmond, Dudley and Griffiths. This opened on 26th September against Plymouth Reserves, with a result 5-9; an improvement on earlier meetings. 'Play was bright and entertaining, Vincent obtaining a well deserved try for Argaum, Grigg converting, but Plymouth Reserves had a general superiority'. A.P. Heard is shown as Argaum's Captain the following week, away to Exeter Reserves. 'Although Grigg was successful in stopping several dangerous rushes, the home side won by a margin of 6-0'. On the same day Argaum 2nd XV defeated R.N.E. College IV at Keyham 8-0 (2 tries by Wilson and a Ford conversion) - Argaum attacking for three parts of the game. The next Saturday the 2nd XV lost 'a very close game' to Plymouth and Mannamead College at Ford Park 3-8, but the 1st XV game versus Pembroke Utd. is unreported - possibly due to it being a 4p.m. kick off. Kelly College were beaten 19-0 by the 1st XV side, with tries by Woolley, Murray, Heard, Woodland, and Perez and 2 conversions by Grigg, 'the visiting forwards were heavier than their opponents and strong in the loose'. A 2nd XV fixture at Newton resulted in a 12-0 win, a side including a number of 1st XV players. Possibly stretched to name two XVs regularly there is considerable reliance on A N Other or perhaps A. Goodman (hopefully! ), but against HMS Cambridge on October 29th the club's half back pairing must have achieved classical heights in the persons of P. Alpha and G. Beta. The club won through two tries by Woodland to a try. The report of Woodland’s second try reads 'he picked up in the Cambridge 25 and ran through to score. Some of the Cambridge players disputed the referee’s decision and a lot of foul play was indulged in by a few of their players, which was very unfair to the rest of the team who did their best to keep the bad temper in check'. On the day, the 'classical' half back pairing resolved itself in Messrs Lendon and Murray. A further win 14-0 over Kelly College, tries by Littleton(3), Moon(1) and a Grigg conversion in 'a very pleasant game'. This was followed by a string of defeats, 0-9 v Ramblers at Torpoint, 0-3 v Blundells School at Tiverton, 0-10 v Paignton Reserves (between two evenly matched sides in a fast open game). Plymouth Reserves (again) 0-6 and Boxing Day 3-32 at Teignmouth. In the meantime, 2nd XV results 0-3 v Hope Utd, 0-21 at Bere Alston and a 21-0 victory over Plymouth and Mannamead College. The second half of the season was somewhat lacking in success, 8-18 v Plymouth Ramblers (Bryant 2 tries, Grigg conversion), 3-8 v R.N.E. College III at Bladdenley (Littleton and Mattheson the full back was off most of the second half and Hitchins W.W. injured a foot). At R.N.E. College II the following week, once again 3-8, Mantell scored for Argaum after running half the length of the field. Had the visitors been a little heavier, the result might well have been different. Then Exeter Training College at the Rectory 0-13 and the only slight break in the clouds, a 0-0 draw v St. Peter at Swilly. There are no reports of any 2nd XV activity during this half of the season. The final game was against Plymouth Albion Old Crocks, who included former Devon County players W. Sowden (1894) G. Sowden (1896) and F. Marshall (1896/7). The report reads ... 'the 2nd half found the Old Crocks failing in wind, and the visitors all but overtook the score'. Play ended Plymouth Albion Old Crocks 17, Plymouth Argaum 15. A rare photo of this time shows P.S. Rogers, G. Woolley, P.E. Canning-Bailey (not in rugby outfit), A.G. Martell, J.B. Shettle, R.S. Pearce, W.W. Hitchins, P. Woodland, E.W. Dudley, R.W. Sharp, W.A. Griffiths, S.J. Lampshire, A.H. Mattheson, J. Littlejohn, D. Wilson and T.J. Hitchins. The shirts are broad bands of white with an alternate colour, which in the absence of colour photography, is probably dark blue or red. Noticeably, several names mentioned during the season are missing, e.g. Messrs Bryant, Grigg, Heard, Vincent and Perez. Possibly the photograph dates from well into the 1904-5 season. This season opened on September 23rd, resulting in a 0-3 defeat at Bere Alston. The published Argaum team for this game contained no less than 5 players of the rank of Lieutenant. Whether this was a naval or army influence it is impossible to say. Also, Messrs Griffiths, Hitchins, W. Dudley and Coles of the 'old brigade' were included. During the following weeks, the published sides showed a marked diminution of the service element, but results and reports are few and far between. October 21st provided a 6-3 win over South Brent in 'a Very pleasant game', tries by Hughes and Grundy. On November 4th Argaum won 14-9 v HMS Cambridge, a goal and 3 tries to 3 tries (no scorers mentioned) and the following week at Blundells where 'the visitors arrived with a very weak team, picking up a full back in town'; after a severe struggle, the scholars won 3-0. HMS Indus II were beaten 11-0 with tries by Hughes(2), Le Provost(1) and a Shepherd conversion; W.W. Hitchins, normally a forward, taking over as full back. It is noticeable that in selection, the full back position appeared to be shared around; maybe (shades of Blundells), it was a problem position. 18th December is the next recorded result, 18-5 over Kelly College, with tries from Egeton(1), Le Provost(1), Dudley(1), Godsell(2) and Shepherd(1). At Teignmouth on 23rd December, the home side won 'an interesting, but one-sided game' 21-3. There are no reports of or references to a 2nd XV during the season - probably the side had ceased to function. On January 18th 1906 at South Brent, the report says succinctly 'played in torrents of rain and hail. Argaum were several short, but nothing was scored on either side'. The following weeks, R.N.E. College III provided the Club with its biggest recorded win to date 38-0, with tries by Oliphant, H. Walker, Ramsey, Shepherd, Pulliblank, Hughes and Hitchins W, with conversions by Shepherd and Woodcock - 2 a piece. Then Plymouth College 26-5, Grigg making a re-appearance, tries by Godsell(2) and Rogers(2) and Dudley with two conversions. R.N.C. Dartmouth were beaten 8-6 on a heavy ground tries by Grundy(1) and Griffiths(1), Shepherd kicking the vital conversion. Then HMS Indus 9-0, 'Argaum had to find three substitutes but won fairly comfortably, 2 balls burst during the game'. Try scorers Hughes, Godsell and Le Provost. Thereafter, 3-0 at North Tawton, where the visitors handled a greasy ball well and from a scrum Purnell scored under the posts. R.N.E. College II were the next victims in a 'rousing game' 13-0, tries by Ramsey, Grundy and Hughes and 2 conversions by Shepherd. There followed a desperately close run victory at South Brent 3 tries to a goal and a try. Unhappily, just at a time when the Club was on a winning streak, no further results or reports are available, although two fixtures in April are listed. To oppose Plymouth Reserves at South Devon place on 15th September 1906, the selected side was G.H. Ley, F.R. Duberty, M. Edwards, L. Godsell, A.D. Meek, E.G. Erde, G. Villar, A.W. Grundy, T.E. Hughes, A.P. Le Provost, E.W. Dudley, P. Harris, W.W. Hitchins, T. Spalding and T.R. Carr - a more than fair sprinkling of new names. Godsell crossed for Argaum following a pass by Dudley, but the second half became a series of scrums on Argaum's line. Plymouth Reserves emerging winners by 3 tries to one. The following week, there were a number of changes in the side to face Pembroke United at Torpoint, including the return of Grigg at scrum half. Argaum were unlucky not to win in a match that ended in a 3-3 draw (Erde try). Modbury were beaten 19-3, but then Totnes 3-8 (Meek try). Kelly College were overwhelmed to the tune of 4 goals and 7 tries (41) to nil and then there followed victory at South Brent 9-0, Read, Grundy and Holden scoring tries in 'a rough and tumble game'. HMS Cambridge were the next victims, 11-0 (McConechie, Hefford and Edward scoring tries with a Grundy conversion), 'A weak Argaum side easily overcame the Naval team'. Next Blundells 17-3. The Argaum forwards monopolised play with tries from Grundy, Dudley, Fawcett, Harris and Edwards, who also converted Dudley's effort. HMS Nile were next, in soft conditions, which suited the ship rather than Argaum, but the ship side were beaten by an Edwards try to nil, giving the club its fifth consecutive win. Then followed South Hams United at Modbury 10-0 (tries by Eede and Matthews and a drop goal by Wright). 'The game was somewhat marred by the referee not having sufficient control over the players'. December is deficient in results - but not fixtures - there is only one record, December 22nd at Teignmouth 3-11 (Harris Penalty Goal). The New Year should have seen the first ever fixture against Plymouth Albion Reserves, but this was postponed. At Dawlish the following week, the Argaum visitors arrived four short, but managed to obtain substitutes. Hyatt crossed for Argaum, Grundy converting in a 5-5 result. Grundy playing 'very finely' at half back. Plymouth Reserves once again inflicted defeat on the Club, this time 11-0 and on February 9th the club once again fielding A. N. Other, gave Dawlish a hard game with only 12 men. Hughes scored a try after 'a tricky run' which he converted, but weight of numbers told to the extent of 5-13. On 16th February 1907, a team including 'old faithfuls' Grigg and A. P. Heard drew 0-0 with Plymouth Ramblers at Torpoint. The next week at R.N. College Dartmouth, tactics came into play, where 'in a splendidly contested game, the visitors played 5 three quarters and 7 forwards which worked so well that midway through the first half the College took a player out of the scrum'. Argaum led at half time with tries by Heford and Perez, Roberts replying for the College. In the second half, Noble and Charley crossed for the College, Charley converting both, whilst Perez replied for Argaum giving a final score of 9-13. There is but one other report for the season, Plymouth Reserves - yet again - on 16th March, resulting in a 6-8 defeat for the club. 'In the second half the Reserves efforts to break through met with a stubborn defence'. Season 1906-07 seems to have been the pinnacle for results and reports. 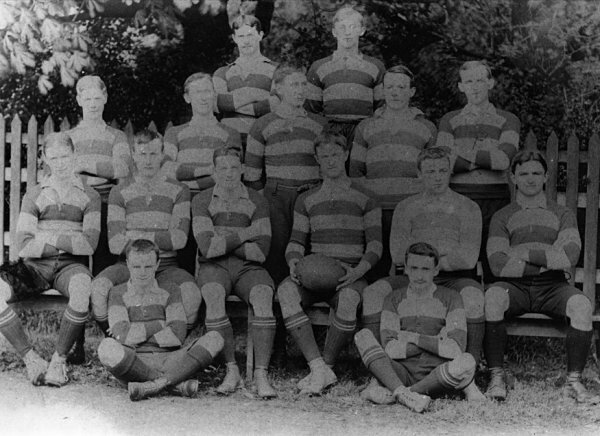 On October 5th 1907, a try apiece versus Modbury, October 19th (old rivals) Kelly College, but no report or result. On November 2nd Plymouth Reserves, of which the account says 'Argaum were weak; there were several newcomers and the visitors showed little combination though no doubt they will improve when they have played together a few times'. Argaum were awarded a penalty try in the last few minutes, leaving the result 3-21. 16th November, an 8-0 win at South Brent and then Plymouth Ramblers on 30th November, a defeat 3-32. On 7th December Kelly College were defeated 14-3, Kelly scored first and then Argaum retaliated with a try which was converted and added a 3 further tries in the second half. This is the sole extent of the information for the first half of 1907-08. Of the second half of the season, there are but five results 6-2 v St. Chad's at Swilly, 0-22 Plymouth Reserves, Lt. Stokes played a strong game for Argaum, but was poorly supported. Other results, HMS Indus 3-0, South Brent 0-8 on 21st March and Plymouth Reserves 0-33. No selected Argaum sides were published throughout the season. If 1907-08 had been a season of poor publicity, the seasons following, until rugby was interrupted by the first world war, were catastrophic. Season 1908-09 has but one published result 30th January 1909, South Brent 49 Argaum 0. 1909-10, if numerically no better, the one recorded result is an improvement - not difficult - 6-8 v Plymouth and Mannamead College, J. C Hawks scoring for Argaum in the first half and a further try was added just in time. Thereafter, until the club's 'resurrection' after the war, no mention is to be discovered in Plymouth's leading newspapers 'The Western Daily Mercury' and 'The Western Morning News'. One wonders whether the club continued to function, but in view of the memories that the club name evoked with its post war revivalists, it seems probable that it did indeed soldier on.